Will You Do the Fandango in Monte Rio? 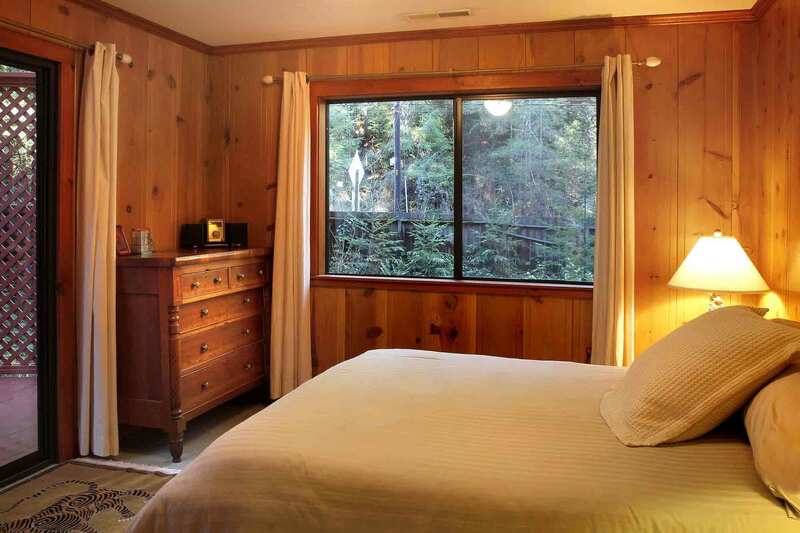 Unusually Private, Updated Creekside Cabin on Securely Fenced Half Acre with Redwoods, Fireplace, Remodeled Kitchen, Hot Tub, Bocce, Creek Access; Short Drive to Dining, Downtown Monte Rio, River Beaches, Boat Rental, Wine Tasting, Golf. Wi-Fi, Landline Phone, Cable TV. Keyless Entry. Your Well-Behaved Dog is Welcome! Your Electric Vehicle/Tesla is Welcome! The living room and kitchen are side by side, with a wall with pass through between. 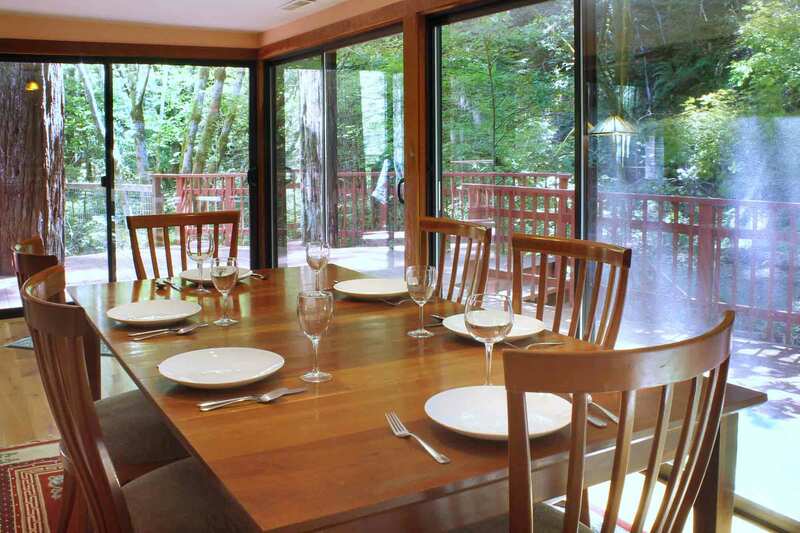 On one end, the living room and kitchen open to a dining deck. At the other end of living room and kitchen, a formal dining room opens to several levels of wrap-around decks, hot tub. Off the deck, there's a gate and steps to the creek. Off a short hall, there are two bedrooms and a bathroom. 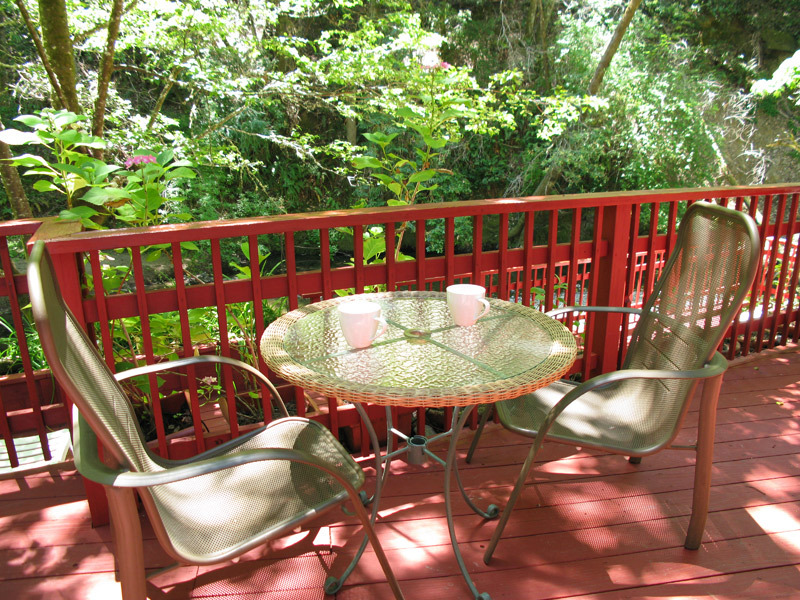 One bedroom opens to the side part of the deck. Just beyond, there's a bocce court to the side of the house. The grounds are landscaped and forested with redwoods. House is approx 1244sf. "Thanks for making our family gettaway so special!" We had a great time in this cozy house! The creek was the best surprise, my toddler loved playing with little rocks next to the water. The kitchen had everything we needed for meals, the hot tub, the deck and all the huge space outside the house are amazing too! Love the huge tall trees!! Communication was outstanding! Thanks for making our family gettaway so special! "This is my fourth stay at BoHo"
This is my fourth stay at BoHo and I still love it! We are Campfire refugees who keep coming back to gather our wits to return and deal with reconstruction. Even during the buggiest flood in 34 years, I still love it and returned to clean up our mess before checking out. Yeah, I love it that much! 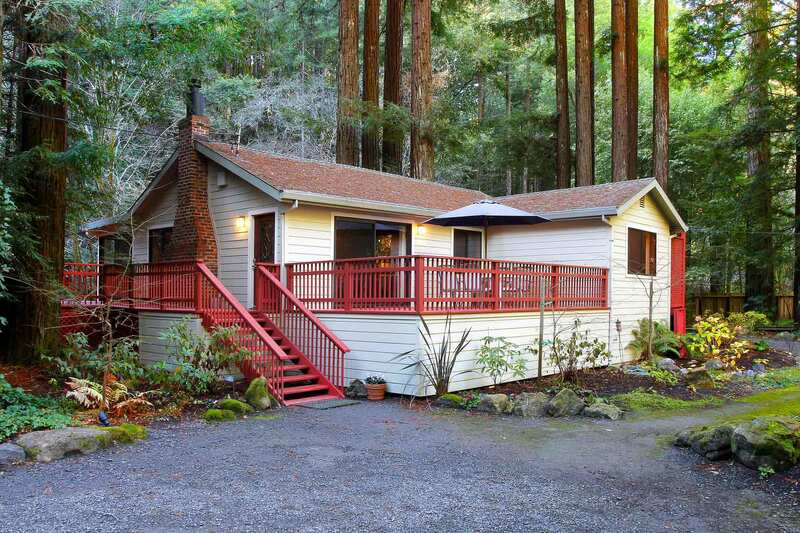 Beautiful, secluded place with a large deck for the hot tub, sting under the Redwoods listening to the creek... couldn’t be better ! "I’ve already booked my next stay here! " Fantastic place, right on the river, bursting with nature and loads of fun! I’ve already booked my next stay here! So worth the visit! This place is idyllic. Nestled beside a creek among Redwood trees, this very loved house was perfect for relaxing and as a home base for our explorations of the area. We will return at the first opportunity. "I would recommend this to anyone, especially during summer"
This place really felt like a great get away from the hustle and bustle of everyday life. The kitchen has everything you could possibly need to make meals and the bathtub has an amazing skylight to see the outside. The river and the trees in the backyard were lush and gorgeous to look at, and the hut tub was very relaxing. I would recommend this to anyone, especially during summer time trips because this house is really set for entertaining. One thing to note: you should definitely check into the house during daylight, since it’s secluded it would be very difficult to find after dark. "We loved this house deep in the redwood forest." We loved this house deep in the redwood forest. 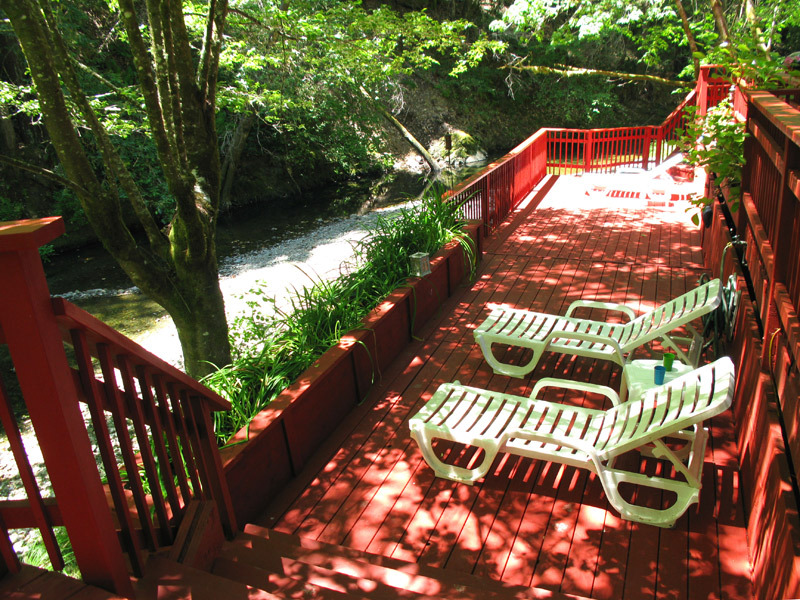 It featured a beautiful deck overlooking a stream and was very private, comfortable and relaxing. High recommended if you are looking for a place to stay near Monte Rio/Sebastopol/Bodega Bay. It doesn't get a lot better than this beautiful spot. Nestled far from the madding crowd, this little oasis by the creek is a perfect base for exploring Sonoma County, or for just relaxing on the most perfect hammock under the most perfect Redwood trees. The hot tub was clean and inviting. Local strolls are not as easy as I'd hoped because of the speed of the cars on the highway, but I'll bet I would have found those side streets or areas to walk if I had more time. I need a softer bed, so next time I'll BYO mattress pad, but that's personal preference. Good clean appliances, towels and sheets. Loved this home! Thank you! "Favorite place to get away"
Favorite place to get away. Peaceful, quiet, clean. We loved everything about Bohemian Rhapsody and we're sure you will too. It's incredibly private with direct access to the creek immediately behind the property making it ideal for bringing your dog; however, be aware there is an escape route somewhere in the fencing because one morning while we were enjoying our coffee out on one of the many decks, lo and behold there was our dog playing gleefully in the creek. Fortunately she didn't want to go anywhere because who would want to leave this amazing peace of paradise but thought it should be mentioned in case you opt to bring your pup. 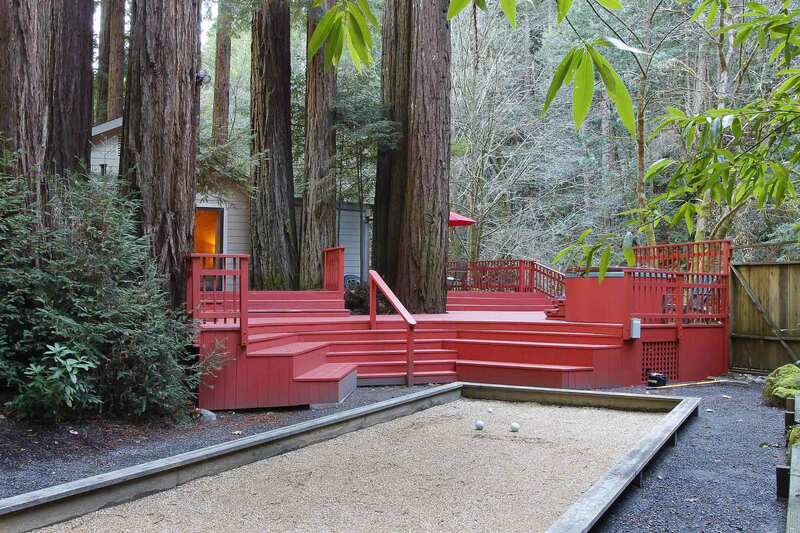 We loved all the giant redwoods towering into the sky, the Bocce Ball was a bonus, as well as the gourmet kitchen. The hot tub was an added pleasure to sit out amongst mother nature but the jets didn't provide much relaxation since there wasn't much pressure. We have found it to be our best Russian River getaway yet and we can't wait to return!!
" the outdoors is the most spectacular part"
We spent all our time on the back deck, enjoying the gorgeous view of the trees and the hot tub. 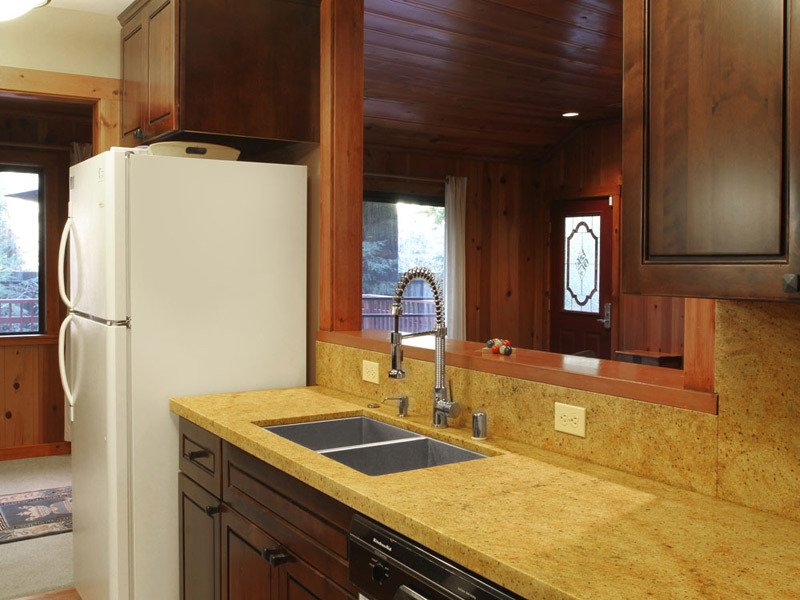 Kitchen is well-equipped, home is comfortable, but the outdoors is the most spectacular part of this getaway. Very private and beautiful surroundings. Peaceful, clean, quiet... loved the deck and hot tub. Perfect place to unplug from urban life! "What a beautiful house in a beautiful setting!" What a beautiful house in a beautiful setting! We could have stayed much longer than a weekend. "Can’t wait to stay here again." Can’t wait to stay here again. Amazing! Would love to stay again soon!!! Great house! The creek is wonderful and we had a blast on the bocce court. Definitely recommend. Also an amazing fenced in place for dogs to be able to explore. Great location, very easy service. Really enjoyed the stay. "This was our third stay here and we are still in love"
This was our third stay here and we are still in love. It’s so private and peaceful. 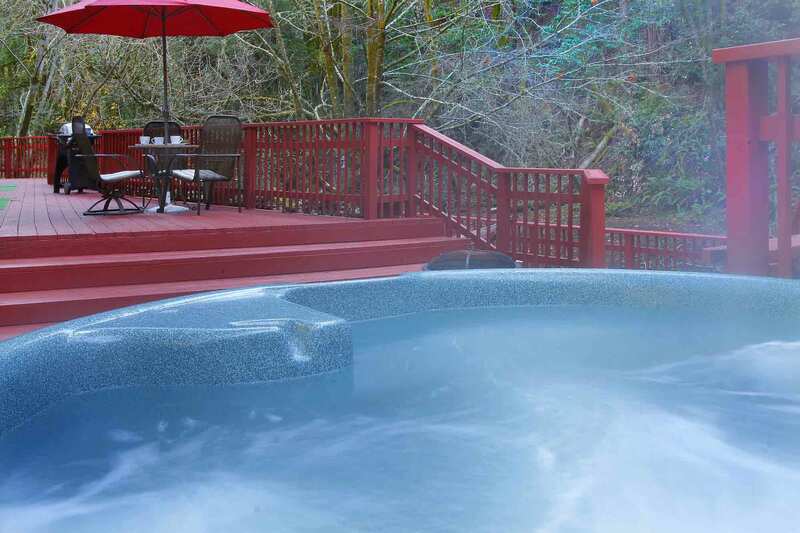 The space is surrounded by giant redwood trees, has wrap around decks and a great hot tub. 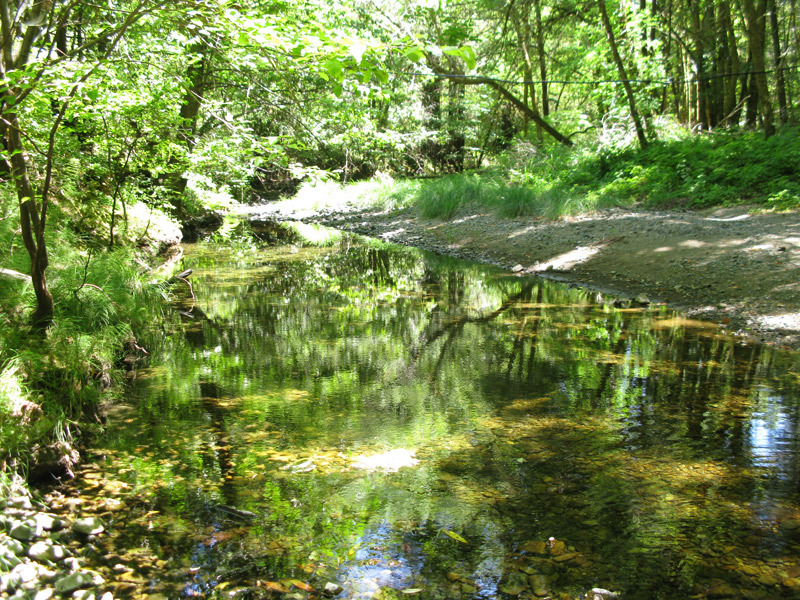 It also has private creek front access where our kiddo spent time wading in, playing with rocks and feeding the ducks. The house is well appointed and a perfect place to unwind, commune with trees and spend time with loved ones. "Lovely and charming space to enjoy the area"
Lovely and charming space to enjoy the area. Everything is thought of and very easy to use. Great place! The deck is amazing, the bocce ball court is so much fun, the hot tub was a great plus, the place was clean and well kept, and the river ran right through the back yard! Can't say enough good things! Truly a beautiful spot, right on a charming creek with soaring redwoods. We’ve been visiting Russian River for two decades, and this is our new favorite. "This place went way above our expectations"
This place went way above our expectations. The house is comfortable and well equipped. Beautiful scenery that backs up to a nice little creek that the kids and dog loved splashing around in. The deck is enormous. Views are plenty. The house is fully fenced and is located next to the main take you everywhere road. So traffic sounds happen (which I happen to prefer) and we never felt bothered by it. Pretty close to hiking trails or an easy drive to the beach, it was the perfect spot for my family and dog to spend a few days. For those interested, the WiFi was 100% dependable for streaming movies and general usage throughout our stay. The seclusion and proximity to the river are incredible. Hope you like redwoods. "Bohemian Rhapsody was a wonderful place..."
Bohemian Rhapsody was a wonderful place for our little family to stay. The large and private fenced yard was perfect for us and our dogs. We loved the scenery and sounds of the creek right outside. And access to the deck from all rooms was great. Very spacious home. There’s a cool little window in the shower that allows you to look up at the tall trees and makes it feel like you’re practically outdoors. Overall a beautiful location, great stay and the hosts are very easy to reach and work with. "Overall, this is a great place to stay"
Overall, this is a great place to stay. The property is beautiful, and the house and wood fire place is great. We arrived after some rain, so the outside area wasn't very functional, but during summer time this would be a great place to stay. The redwood trees surrounding the property are beautiful. The location is great for visiting Sebastopol, Occidental, Duncan Mills, etc. We highly recommend the Barlow in Sebastopol. For those that are looking for serenity, one thing to note is that Bohemian Highway does have quite a bit of road noise and this house is located right off the highway, so expect a car or two every ~five minutes if you're outdoors (like in the hot tub). "Can't wait to come back..."
Can't wait to come back to this wonderfully private and safe natural escape. House is spacious and very comfortable with an open layout, large modern kitchen, beautiful wood paneling, and a tiled shower that looks up at the trees through a skylight. Some of the interior and electronics are a little dated given it also has some very modern features like a tesla charging station and smart thermostat, but if you came here to watch TV, you're in the wrong place. This house is all about the outdoor space and amenities, which are unparalleled. Gorgeous landscaped gardens, literally enveloped by redwood trees on all sides, wrap around multi-level decks, patio doors that can open the house up nearly 360 degrees weather permitting, a clean well-functioning hot tub, olympic-sized bocce court w/lights, hammock, fire pit, grill, all surrounded by a high fence for total privacy and kid/pet security, and the coup de grace, a gate that leads to a private slice of the creek deep enough for swimming when it's warm enough (wasn't for us though) and a little sandy beach. Overall just a beautiful, peaceful, comfortable, and easy place to relax, have fun, and enjoy the unique outdoors that northern California has to offer. We had an incredibly relaxing stay at Bohemian Rhapsody. 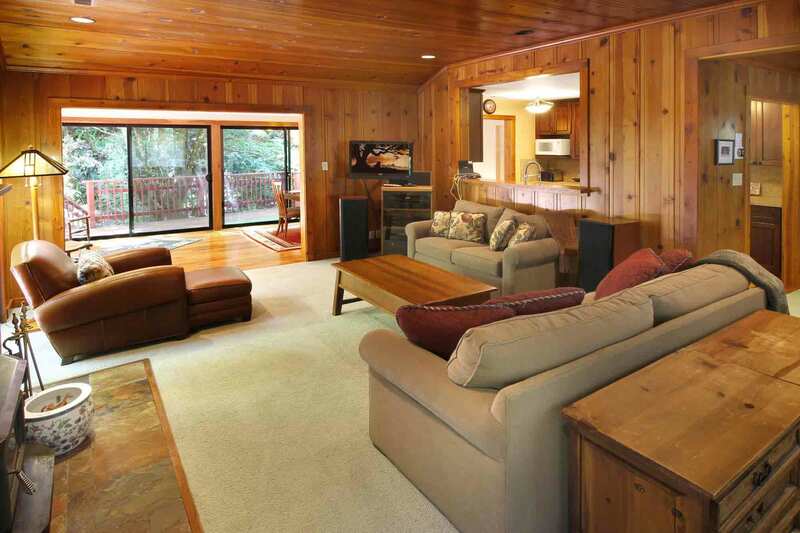 The house has everything you need to get away from all including a cozy fireplace, hot tub and well-stocked kitchen. We even enjoyed the skylight view above the shower. We would definitely stay here again! We come to Russian River for every Thanksgiving for the past 5 years and this place is our favorite spot so far. Close to wineries and the ocean. Very secluded, sounds of the creek are amazing, especially while you are relaxing in the jacuzzi. The house itself is beautiful, making the best out of the forest views around. It is also sparkling clean and has everything one needs. Bocce ground is a plus, but we never got a chance to use it. We would love to come back next year! "Perfect for adults and children"
The stay was fantastic! Our two daughters had a blast. River Getaways was awesome! They were everything you'd want them to be - easy to reach, friendly, responsive and helpful. I had questions about the property before our stay and every question was answered quickly. We were not familiar with the area and their website was very helpful, with things to do and places to see. We even booked a great rafting trip using one of their suggestions. We had a couple of basic maintenance issues come up during our stay. While we declined the offer to come and fix things during our stay and they were at the gate, right at check out time, ready to fix things up for the next guests. Just love Boho, it is so peaceful and relaxing! Absolutely love the beautiful setting in the trees. This is our 12th year of coming and it never disappoints! When we leave, we start thinking about next year! Thanks for sharing your wonderful slice of heaven here on earth. "We love this spot! " We love this spot! We stumbled onto it a couple of months ago and couldn't wait to get back. 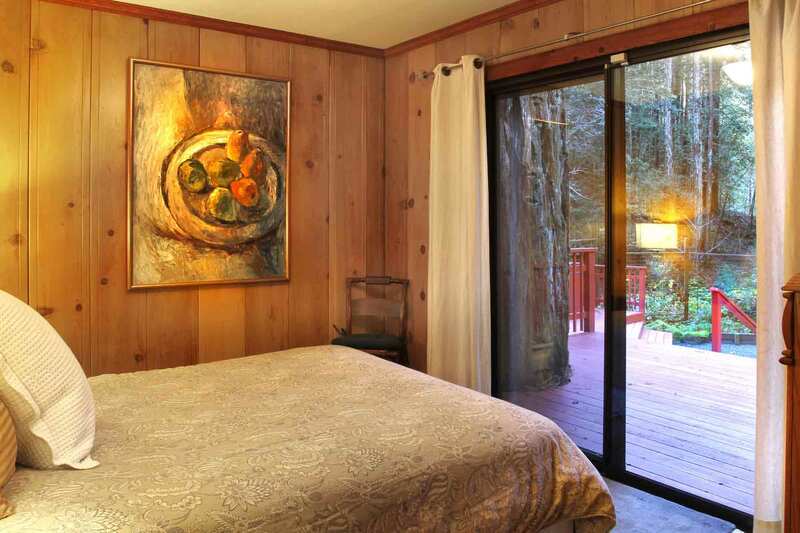 The property is fabulous with delicious privacy, so many redwoods, hot tub and creek. My husband and I spent hours each day sitting in the shade of the creek with our 1 year old playing with sand toys at the waters edge. And the booking is easy, Hunter who we have worked with twice now is perfect. We haven't needed anything during our trips because the instructions and accommodations are perfect but we feel like if we did we'd get a quick and helpful response. "Wonderful house by the creek"
This is a gorgeous property! The house was spacious for 4 people and the access to the creek plus the bocce ball court was a great hit with the kids! We did not use the hot tub so I can't comment on that except that the location of the tub is super just overlooking the creek. Very neat and will definitely recommend! Great spot. Thoroughly enjoyed our weekend. This place was amazing. Right off Bohemian highway, you turn in, close the gate and are completely enclosed in your own beautiful forest home. We have an almost 1 year old and the house was quite kid friendly. Most of the inside space is either wood or glass with views of the towering redwoods or tree dense mountainside at the base of the creek. We BBQ, we ate outside, we sat at the river's edge, we watched the ducks, hung in the hammock, soaked in the hot tub and put the rest of the world out of our mind for a few days. Wonderful relaxing place. Nestled in the redwoods over looking a creek. Spacious living and dining room. Nice kitchen, just needed some basic condiments. Nice outdoor areas, too cold for us to go outside. Bedrooms and bathroom a little small, but it was fine. Needs some minor TLC to a few things. We will stay here again during warmer weather so we can really enjoy the property. "Perfect spot for a quiet family getaway"
The house and property are exactly as pictured and described. I have older children and a dog and this was the perfect spot for us to hang out. The home is clean, comfortable and has everything you need. A huge deck surrounds the house. Unfortunately the weather was too cold for us to take full advantage, but we enjoyed the hot tub and bocci court. The property itself is amazing! Beautiful redwoods and right next to the creek, which my dog especially loved. The booking was quick, easy and straightforward. Instructions were clear and complete. No problems whatsoever. Our family of four had a wonderful, relaxing weekend at Bohemian Rhapsody. 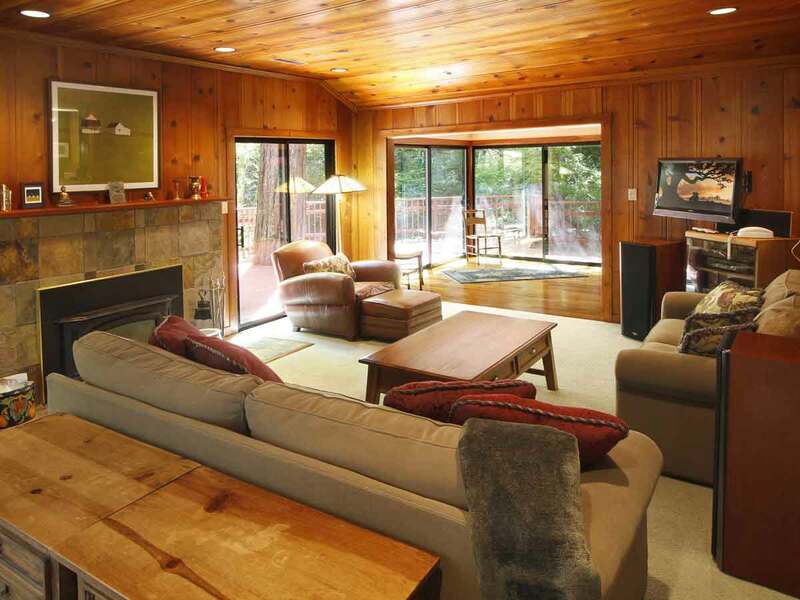 The property is very private and the house is surrounded by astonishingly tall and beautiful redwoods. We especially loved reading on the huge deck and soaking in the hot tub under the stars. The house itself is comfortable, clean, and quiet; and it's well-situated between Monte Rio and downtown Occidental. Our young kids played for hours in/along the creek -- finding interesting rocks and observing slugs and waterbugs. We appreciated how uncomplicated the reservations, check-in, and check-out processes were. We look forward to returning soon! Property was as described. 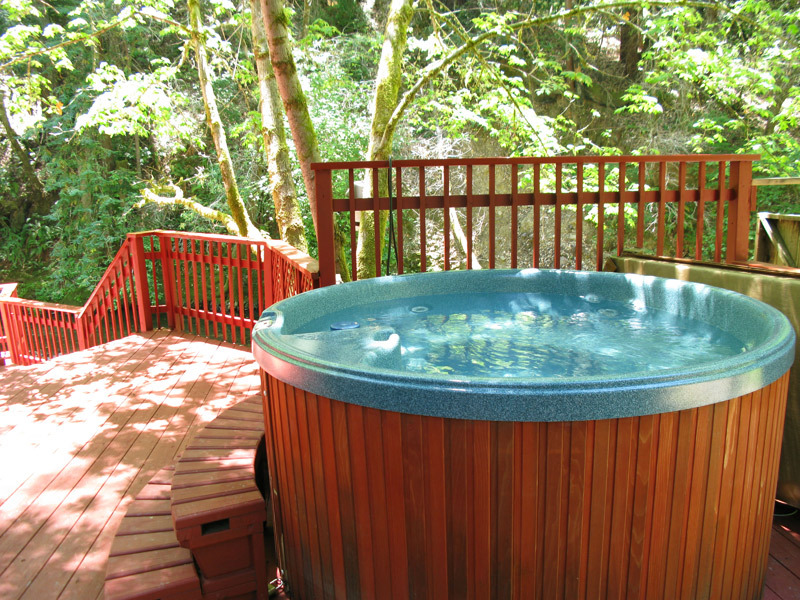 Back yard was enjoyable with hot tub, redwoods, games. Very cosy & comfortable yet close to town. "This little place is so peaceful..."
This little place is so peaceful and tucked away. We sure did forget about the busy city for a few days. A great place to escape to relax! "Great stay at a great place! " Great stay at a great place! Perfect spot for post-Gran Fondo relaxation - deck/hot tub/bocce area are huge, place is super secluded/private, clean and well-maintained. Check-in was seamless, will definitely be back! "This is a very peaceful place to stay!" This is a very peaceful place to stay! 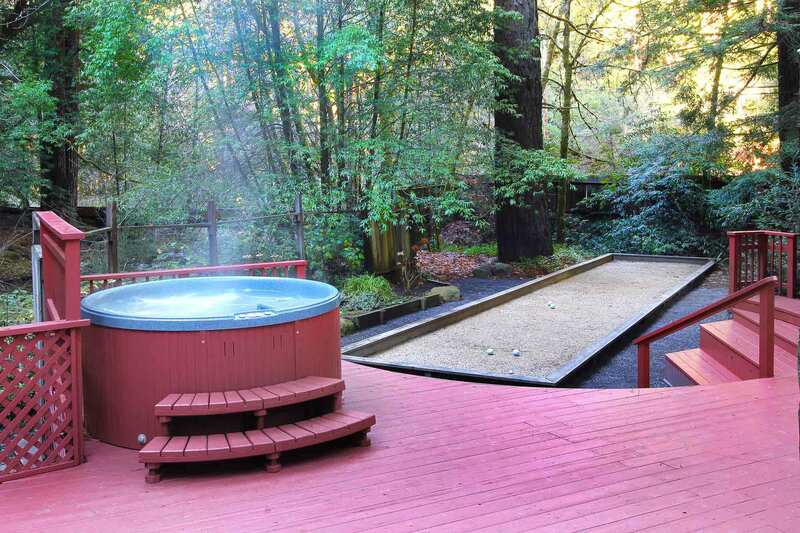 Hot tubbing beneath the redwoods and in view of the creek was wonderful. The house itself is cozy and sweet. The only downside is you have to drive to hike. It didn't feel safe to run or walk along the side of the road to travel anywhere on foot. "Everything you want in a family getaway"
The property was just beautiful. The amazed expression on my baby's face when she looked up and saw redwoods for the first time was just priceless. we have two small kids, so the amenities on the property kept us busy without having to leave--bocci ball, hot tub, splashing in the creek, running around in the enclosed lot, and then satellite TV when everyone was too exhausted for anything else. Nice stay. "We had a lovely time at Bohemian Rhapsody! " We had a lovely time at Bohemian Rhapsody! We loved the convenient keyless entry. 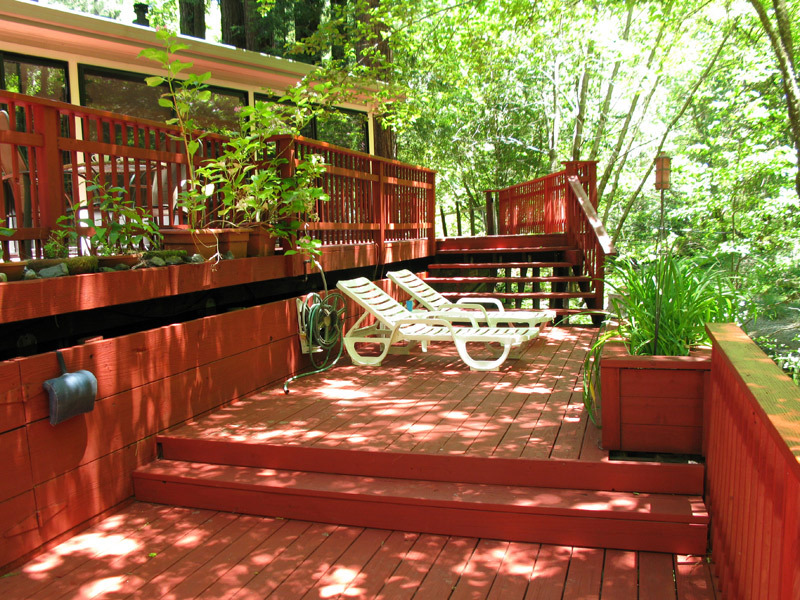 The house was was just as described... very clean, beautifully situated in the redwoods, huge decks to enjoy the peaceful grounds, which include a creek running through the backyard. The property is huge and fully fenced - our dogs loved it and were in heaven. 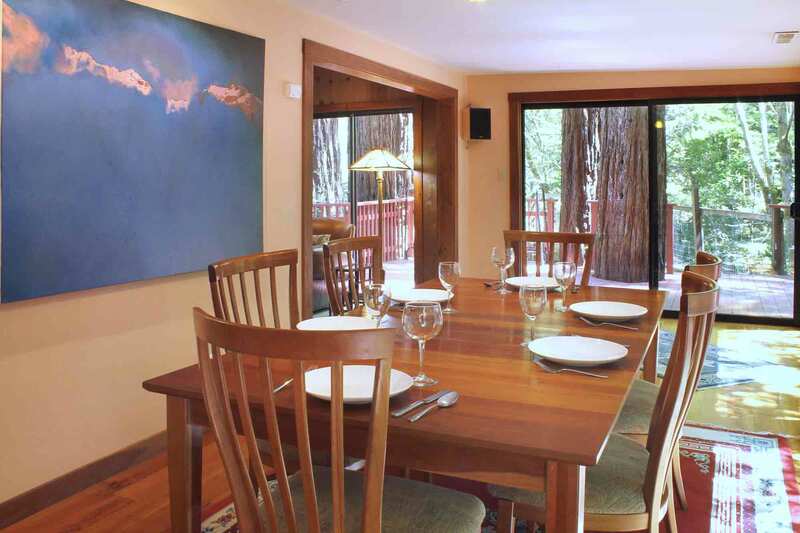 The house is very close to great wine and food in the Russian River Valley. Great location! Thank you so much for a wonderful stay! "The house was nice, but the rental agency not so nice"
The house itself was great. Nicely decorated, spacious, lots of of outdoor area to roam around, nice hot tub. We have a small dog and a toddler. The gated outdoor space was perfect for them. They cold just roam around and we didn't have to worry too much. The property is on a major HWY in town. It is NOT quiet in this space--especially during the week when folks are going on with their daily lives. The surrounding redwoods are peaceful, but be prepared to have your mellow harshened by zooming cars at most hours of the day. The beds are really uncomfortable too, but that wasn't a biggie. If you're tired, you're gonna sleep. Russian River Getaways (the rental agency) could've been a lot more helpful. We were planning for a vacation filled of Russian River adventures (in the water). When we got there we found out by friends and then town people the the water was filled with a poisonous algae--very harmful to both children and dogs. That would've been nice to know beforehand..what if we didn't have friends that knew? If my kid or dog got sick I would've NOT been happy. So half our vacation plans didn't end up happening because of the lack of 411 provided. Lastly, be prepared, they tell you your check out is 11:00 but they have clean up staff showing up more like 8:00-9:00. NOT COOL! I expect to use every minute I paid for. I sent the people away and told them to come back when my family was out. The person sent to clean the hot tub was EXTREMELY RUDE too. Like I mentioned, the house is on major HWY...apparently there are prolific drug users in the area. They were dumping their needles in the garbage outside the gate of the house. The tub cleaner basically accused my family and I of dumping these needles there. WHAT??!! First of all the fact that IV Drug users are out wondering around the house that my family and I are sleeping in at night is disturbing enough, but to be accused of being the person dumping dirty needles threw me over the edge. I complained to the company, but that didn't seem to matter too much. Moral of the story... the house is nice, there may be druggies wondering around outside shooting up while you're asleep (the owners should put a lock on the gate from the inside btw), the hot tub is great, but it's noisy because of the traffic in the area, and don't think you'll get much help from the rental agency especially if there are poisons in the water that you should be aware of to keep your family safe! "Lovely house - would stay here again"
The property is fully enclosed so my dog was safe and happy. The creek access was nice for her too. Monte Rio beach is only two miles away and dogs are allowed off leash on one side. We had a great time there.The Bocce ball court outside was fun and there are lots of places to sit outside and enjoy a good book. The inside of the house was cozy and comfortable. We all had a great time and would stay here again. This property is beautiful...We had a wonderful stay. It can be hard to find and GPS systems get it wrong so you need to follow RR Getaways instructions. Once you are there, you can close the gate off to the rest of the world. Full 1/2 acre. Was perfect for my dogs and they had a great time. The creek actually had water running through it in mid June. Did not use the hot tub or BBQ. We wish that we had booked this rental for an entire week. Three days was just not long enough. A wonderful vacation. Very peaceful and quiet. Amazing outdoor space, fully stocked kitchen, great gas grill. The property is securely fenced - our dog loved it too! This is for sure one of the best places I have stayed up at the Russian Rivereverything was beautiful and nicely equipped.We saw deer right outside the huge windows all alongthe back side of the house. Love the parking close to everythingin the area. Love the decks and garden. We had a great week at Bohemian Rhapsody. The setting is gorgeous, the creek was fun to look at and play in, and the inside of the house is great as well. It was beautiful driving around the area, everything was so lush and green. April is a great time to visit the Russian River area! "Comfortable, convenient and well kept"
My main purpose was a quiet getaway. I spent 11 nights at the Bohemian Rhapsody in November with my 2 dogs so the securely fenced property was most appreciated. The landscaping is lovely and well kept as is the home. It is very pet friendly! The home itself is comfortable and well stocked with what appears to be a recent kitchen upgrade...very nice! The wrap around decking is wonderful...I was even able to play fetch with my Lab when it was muddy from the rain so as not to track dirt into the house:) The tv and movie remotes proved to be a challenge as there were about 5 remotes. Fortunately, I don't watch much tv but an all-in-one remote or a consolidation might be a plus for non-tech folks such as myself. 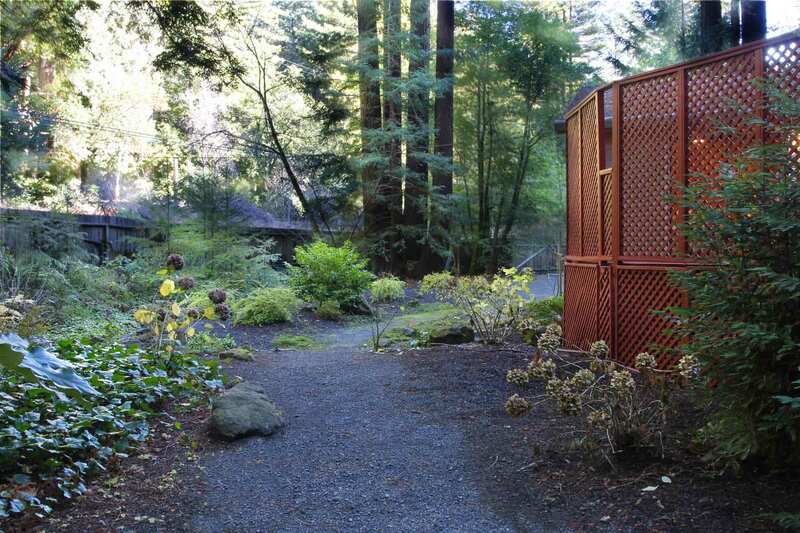 A really peaceful setting with gorgeous giant Redwoods &amp; lovely gardens made our stay most enjoyable. Thank you to the thoughtful owners. P.S. Did not use the hot tub or bocci ball court so can't comment on those. "Comfortable, perfect for dogs but..."
My husband, sister and I stayed at this charming cabin end of July 2013. It is on one of the main highways, but that wasn't a problem at all. What we loved about this cabin especially was the fenced in yards all around the property with beautiful gardens..perfect for photos. Our dogs love to swim and with the creek right there, we never left! The home was comfortable over all and the kitchen well equipped. The not so goods :( but fixable... Bring your own blow dryer as the one supplied does not work and we tried everything to get it to work, the toaster only works if you stand there holding it down, the BBQ was gas but only one burner was workings (we had to buy a BBQ while we were up there!!! ), we called that night and left a message w/ management, but no one came out to fix, the screen door's fells off in one of the bedrooms when we went to slide it open, the livingroom lights were burned out (2 of them only), The beds have this 3 in mattress on top of box spring..really its a mattress, not the typical size, so not for comfort unfortunately..but don't distress..as maybe when you get there it will be fixed and repaired..it was a nice stay overall..
A cute cottage next to a creek with a fenced yard was the ideal spot for our weekend. "Nice family vacation home with the kids & the dog"
Perfectly secluded inclosed home. Took full advantage of the wonderful deck for Bbq's and hot-tubing. One suggestion would be more bug repellant outside and maybe some available in the home for guest use. But I am a bug-a phob so it's probably just me as it didn't bother my husband or the kids one bit. Overall beautiful well kept home in the forest over looking a creek! My husband and I and our dog, Badger, had a wonderful time at Bohemian Rhapsody. It was spacious, lots of room for the dog to run around the fully fenced yard, well stocked kitchen, clean, great hot tub, expansive decks overlooking a beautiful creek and the bocce ball court was definitely a bonus. We visited Bodega Bay, Occidental, Valley Ford (where we had a great dinner at the hotel - oysters, clam chowder, yummy chocolate dessert). The only drawback, mosquitoes, so bring your insect repellant if you don't want to get eaten alive! We had a wonderful time at Bohemian Rhapsody. The house is adorable! It is alongside a main road, but was quiet and felt very secluded. The fence was high enough that you can't be seen from the road, and not another house in sight. The back of the house faces the creek and a beautiful hillside. The yard was completely fenced in so our dogs could run free. Landscaped yard, bocce ball, hot tub, walk out the gate to the creek... what more could you ask for? The dogs were in heaven splashing around in the creek, and our puppy figured out that she could swim! There was also something about this house that inspired us to watch "Romancing the Stone". Weird, huh?! :) We will definitely be coming back! We had such a nice stay at this comfy, cozy house. 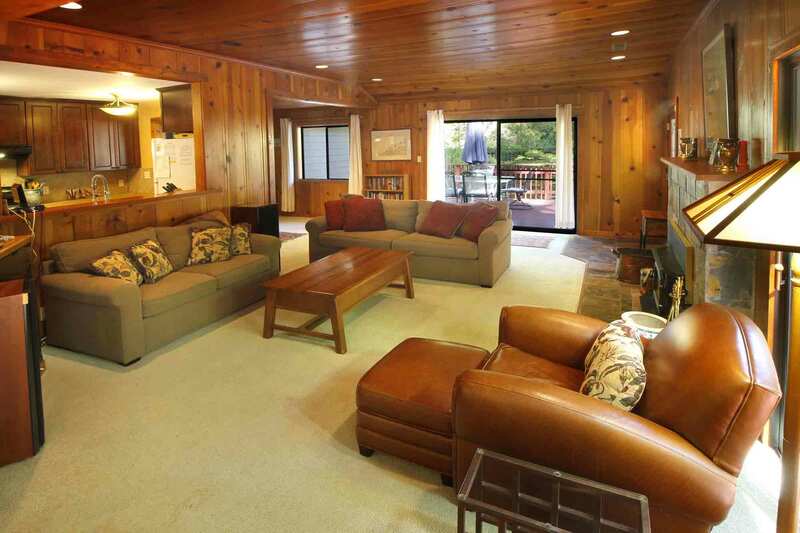 The main living areas are almost all windows and the house is surrounded by a spacious deck and redwood trees. It feels like you are staying in a large, pretty tree house. 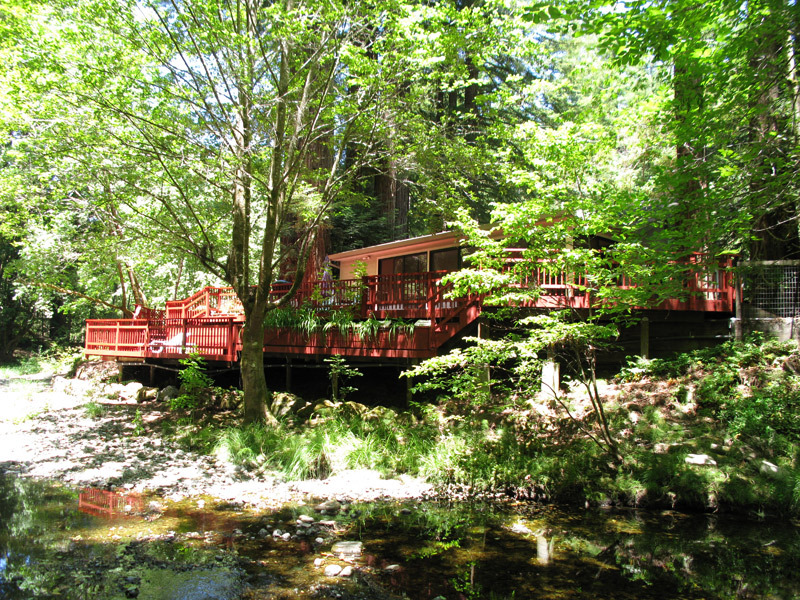 Don't miss an afternoon nap in the sturdy hammock under the redwoods with the bubbling creek right next to you or a game on the bocce court. The house is right on the road but the setting is still quiet and peaceful. Kitchen is well equipped. Bedrooms are basic but comfortable. Monte Rio and the river are a short drive (or long walk). We also had a wonderful time hiking in nearby armstrong Redwood Natl. Park. This well maintained house was perfect for our group of four. Fabulous house in a great area! Loved our stay and can't wait to come back! "A piece of heaven in the woods"
this was a last minute weekend get-away and it couldn't have been more relaxing. Having a secure fenced yard means our dogs can roam around and we don't have to worry about them at all! the house was very comfortable and well equipped. The worst part was deciding which deck to lounge on! Definitely staying here again. 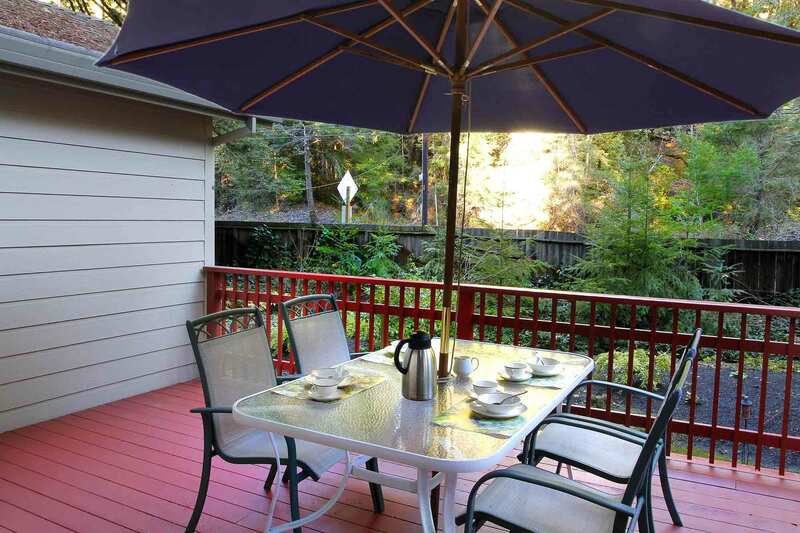 "Hidden Oasis off the Direct Path"
"2 Week adventure in the Redwoods on the Russian River"
I stumbled onto the Russian River Getaways website while trying to plan a family summer getaway, and I was pleasntly surprised by what I found. I researched my things on their website, that was full of great information about the area and services they offered. I booked a 2 week cabin vacation and hoped for the best. I had follow-up questions about my booking and Jewels was very helpful and treated me like a life time friend of hers. When we arrived at the cabin we had a few issues the first day and during our stay, they were immediately addressed by a wonderful lady named Naomi at RRG, and Jim the Handyman, again they treated me like family. I would recommened RRG to anyone. The house was charming and felt like a second home and in a perfect spot for a family with children and dogs. The Redwood trees all around and mountain out back with a beautiful creek running along the base for the length of the property ( The kids loved it ) the water was crystal clear and cold ( but fun to play in ). The wrap around deck was great and the hot tub was perfect on the cool nights. We really liked having no house within a 1/4 mile, but the house is on a busy road. A little car noise in the middle of the day, but the convenience is worth it. You are about 10 minutes from everything, it was perfect for us. The Ocean is close ( see Bodega Bay and Salmon Beach ) and river beach ( Johnson's beach in Guerneville ) Civil War Days (Duncan Mills), easy hiking Redwood forest (Guerneville), Great Dog park/fenced/off leash ( Rio Nido )Grocery Store ( Safeway in Guerneville ) Places to eat Guerneville - La Tapatia(Mex),Trio's(Amer),Andorno's(pizza),Icecream(across street from Safeway) and Johnsons Beach Snack Shack(Hamburgers/Hot Dogs, but no fries).Duncan mills - Cape Fear Cafe (Seafood)The kids had the most fun at Johnson's Beach (Canoe,Kayak,paddle boat,swim,tree swings over water, and a must wear pool shoes. and good cheap food).God Bless !! My wife and I had the first opportunity for a vacation by ourselves since our kids were born 10 years ago. Based on the online pictures, we finally chose Bohemian Rhapsody. And we couldn't have been happier! This is a completely secluded house. It had no cell coverage, so we were able to disconnect from intrusions, but the Internet access was excellent, allowing us to download and enjoy some movies. The hot tub was incredibly relaxing. For dinner, we discovered a number of excellent restaurants, including one in the nearby hidden town of Occidental. We also made a trip out to Healdsburg where we hadn't been to since we got married there 11 years ago. So, all in all, quite a memorable and nostalgic trip. Thoroughly enjoyed our stay. 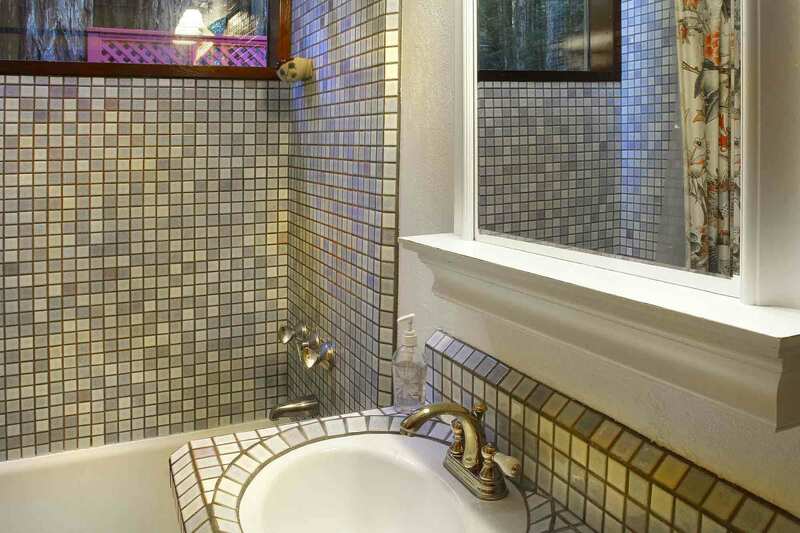 So many properties in the Russian River area suffer from lack of privacy, not this house! Serene, quite, peaceful..not a soul around. Left our dogs at home but boy would they have had a great time! The property is completely and securely fenced in. My only complaint is the directions to use the multitude of tv/video remotes was outdated and did not reflect the current tv so it was a bit difficult to operate, but who comes here to watch tv! We will be back. Fantastic rental -- convenient location, ideal for dogs (fully fenced) and very tranquil. Thoroughly enjoyed our stay. Everything was wonderful, except a few minor complaints. The hot tub was very dirty, so that kind of kept us away, and the lights for the deck had problems so we had trouble playing bocci ball after dark, and there was also no firewood at the home (we didn't think we had to get ou own). The home was beautiful though and had great picture windows in the dining room that were wonderful to look out over breakfast and dinner. The home was right on a main road, so that was a little annoying, but not too noticeable. The bathroom, laundry room, area, and everything else was wonderful! "Perfect weekend getaway with grandparents, baby and pooch"
We loved that this place was completely fenced in for the dog, had a creek for her to swim, and a hot tub for us. The house was very comfortable. There were puzzles and games in the drawers, and even toys for the dog. We couldn't get the BBQ to work and we couldn't find the firewood. The dog loved running around outside. We would definitely stay here again. I enjoyed our stay. Pros: Private creek entrance, our 2 dogs loved it. Privacy. Comfortable. On demand TV. Fenced off 360 degrees. Hot tub. Bocce ball.Tennis and basketball courts nearby. Great biking once you get onto 116. Nice deck. Comfortable bedsNegatives:Not enough of a bike lane from the cabin on Bohemian Highway for walking the dogs or biking. Ran out of toilet paper. Raccoons got into garbage and I had to clean it up. Cans not quite secure enough. Some mold smell in guest bedroom. "Great location for a quiet retreat"
The location of this home is perfect for a quiet retreat. Wine on the deck enjoying the river before dinner. Looking out your bedroom window to see the sunshine streaming through the redwoods in the morning. Close enough to town but a feeling as if you are far away from it all. "Peaceful, secluded and absolutely wonderful vacation destination"
Bohemian Rhapsody is very secluded and the most tranquil home we've been to!! We couldn't say more about how relaxing this place is. From lounging on the deck looking down at the creek to seeing at all the beauitful trees surronding the property and throughout the deck. From soaking in the hot tub to having massages right there on the property, it's just the ultimate relaxation location. We will definitely be coming back here, no questions about that. "For a restful get away this is the place." Very beautiful house and decks all the way around with the peacful sound of the creek and beautiful redwoods, almost heaven. We all had a fun, restful four days. "Lovely home but too close to road"
Loved the property except the road noise. Great home for the dogs. 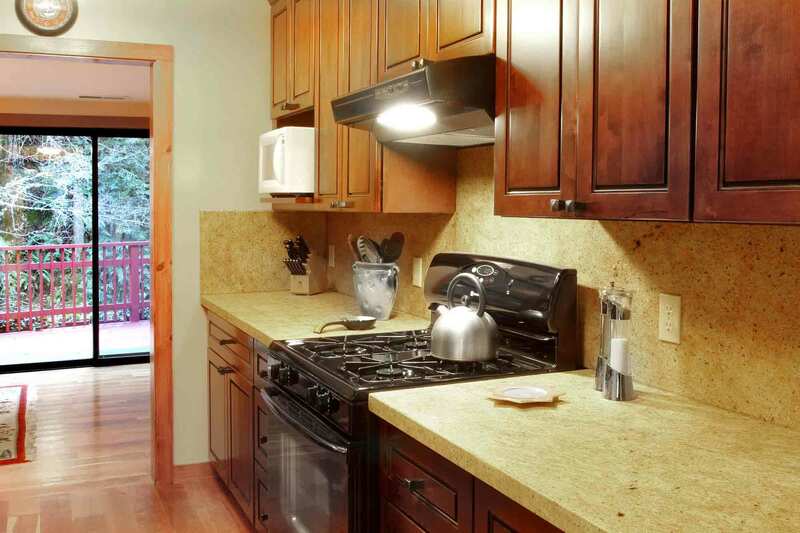 Kitchen well equipped and very nice creek access. "Nice house by the river and the road"
This would be a wonderful place to stay if it weren't so near the road. The owners make a good effort to fence in the house, but the cars take away from the nature experience. It wasn't clear on the Russian River Getaways website except for the address (on Bohemian Highway). I guess that's understandable, but I was disappointed. I didn't notice the address though, and so I thought I should give fair warning here. Otherwise, our stay was very nice. The most private place we have ever stayed. Our yellow lab loved the creek and the large fenced grounds. We would love to come back sometime. The house and grounds were great. Nothing more special than Redwoods in the rain. The only thing is to make sure you are not there in torrential down pours. The water in Dutch Mills Creek came up to the lower deck. I was up all night watching it. I packed my car without waking my wife. I was doing ok until the power went out and the back up generator did not work the battery was dead. From then on I was using flashlights to keep checking the water level of the creek. The rain stopped about 430 am I watch the creek for another hour till I saw the water going down. The other problem with no power is no water because it needs a pump to work. Out side of Saturday night the rest of the trip was real relaxing. "Totally private and woodsy hideaway"
We loved our stay at the Bohemian Rhapsody. The entire property is fenced, so if you have a dog he/she can roam free without any concern. The pictures of the place truly don't do the house and the outdoors (namely the ample deck space and surroundings) justice. You feel so far from civilization, tucked in a redwood forest on the creek. We even went in cold/damp weather and loved it, which means the summer must be amazing. And the bocce ball court is such a fun addition. A great way to spend a nice weekend away! Simply Fabulous!!! Bohemian Rhapsody was great fun. Loved the house. It was warm, relaxing, spacious, yet very cozy. The yard was like a park. Gorgeous landscaping, very private, perfect for my Pugs. I think the Pugs thought they had their "own dog park". It was wonderful. The Bocce Ball court was definitely fun. New for us, now hooked on it. Fabulous deck. Loved the various levels. Looking forward to our return to Bohemian Rhapsody, hopefully soon. We forgot our CDs at home, so it was nice to have a wonderful selection of fantastic music to choose from...thank you. The keyless entry was nice. Liked not having to check in/out of the main office. Bohemian Rhapsody Rocks!!! What a wonderful place to go to find serentiy, a place to relax with a wonderful view. Away from everyone, this is a perfect place to unwind, no neighbors in sight. Love the landscaping, trees and view of the creek. Clean and well maintained - even a hammock to lay down and read or take a nap in! These were lovely guests and they insisted that they did not want to be disturbed during their stay, so we honored their request. We didn't expect to be criticized for that. The electrical problem was created by work an electrician did just before these guests checked in and he was more than willing to come out to the house immediately to fix his mistake. But the guests refused and said they were fine. There was no problem with the spa; they made two reports that the water was cloudy, which was due to a periodic condition in the well water. The spa maintenance vendor made two trips to the house just to reiterate that there was no problem. The house is not at all neglected. The owner has spent a fortune creating a paradise here, just completing a large landscape project. The rainy, windy weather made it impossible to keep the outdoor furniture clean, but we are reviewing it all to see if any needs repair or replacement. Again, we would have been happy to fix the gate latch which broke during their stay, but again the guests did not want to be disturbed. This is an absolutely beautiful, well-maintained home and we do regret that the guests chose to criticize us for the electrical problem rather than allow us to have it fixed immediately. All is well now. We have a great time at Bohemian Rhapsody. The house, yard, and decks are beautiful. The house was clean and updated without any of the problems that other reviewers noted. The house is on a busy road so noise from traffic is a reality. If you bring a CD player and a long extension cord for outside, though, you won't notice the noise. We also recommend that you bring blankets for the beds (they have heavy quilts that were too much for the summer) and pads for the outdoor lawn chairs (seats and loungers). Otherwise, the home is fantastic. We had a wonderful, romantic vacation there. The service we experienced was good. The home was fine, the decks were great and the creek still had water in it, so we enjoyed sitting on the small beach near the water.We played a lot of bocce ball on the wonderful bocce court. That was a big plus. Also the tub was very nice and was checked after during our stay.The house itself had everything we needed. Everything worked well.What we had not expected was a lot of noise from the road, lots of traffic there. The house itself is very private, no neighbours. We loved being among the redwood trees and the wellkept grounds,we loved the beach at Monte Rio, we regretted the sun leaving the decks relatively early in the afternoon. Overall we enjoyed our stay very much. I wonder if this was an usually busy week on the road. There really isn't much traffic here normally and what road noise there is usually is noticeable only from the front porch and front grounds--and this house is set back quite a bit from the road. But perhaps this is all relative---road noise is mostly a given in this area so we might not notice it as much as a guest might. Bohemian Rhapsody is a spacious home with great light, clean, simple and lot's of privacy. We enjoyed a lovely stay while celebrating our 10th wedding anniversary. The property was a perfect pick for our two dogs. The fully fenced yard and creek access was ideal and allowed us to roam freely without worry that the dogs would interrupt or bother neighbors. The beds were comfortable, bathroom was big enough to share and family room was open enough to move around without constantly bumping into each other. The in-house amenities could have used updating and/or maintenance. The kitchen oven/stove desperately needs to be updated or replaced. The knobs controlling the oven had to be removed and reused to control other settings. The bath towels had multiple bleach spots and even after washing continue to have an odor. We replaced the BBQ grill brush because the existing one did not have any bristles and multiple light bulbs and batteries needed to be replaced throughout the house. All of these items of concern should be looked into and maintained better for future guests.